Principal Update: New Semester, Stronger Attendance at McKay! As we transition into semester 2 of the 2018-19 school year, it’s important to keep regular school attendance a priority in your child’s life. Throughout the district, you may have heard about Every Day 24J, the districts attendance campaign to help raise awareness about how chronic absenteeism affects our students. Did you know we currently have nearly 1 in 3 students who are chronically absent across the district? That means 29 percent of students are missing, on average, two days of school each month. If this continues, chronically absent students will miss out on an entire month of instruction for the 2018-19 school year. As you would expect, this impacts learning at foundational levels and can negatively impact a student’s likelihood of reaching high school graduation. How can I help my student be at school every day? Every once in a while, your student may need to miss school. When these situations occur, it’s important to communicate with us. If unforeseen challenges arise such as transportation or child care – we can work to connect you with resources to help. When a child gets sick, it can be difficult to determine if they are too sick to attend classes. Utilize our when is sick too sick flyer to help you determine if your child should stay home. If your child needs to stay home, it’s important to communicate with us to ensure they can stay on top of all assignments or create a plan for absence. As a parent, grandparent or guardian, you are your child’s most influential teacher. Talking positively about how education can impact your child’s life and setting expectations with your children early about attendance can help your child feel motivated to attend regularly. For students, there is often much more to school life than attending classes. Staying involved in your child’s interests and helping them navigate after school activities can help students feel more connected to school. Remember to regularly check our website for an updated calendar of all the activities and event we offer throughout the year. Attending conferences allows for open lines of communication with your student and their teachers. This helps you identify if your child is struggling in a particular area and how to connect them with proper supports. At McKay High School our vision is ‘Every student graduates college and career ready.’ Students who regularly attend school are more likely to graduate, setting the stage for success in college and higher rates of employability. Again, as we transition into the second semester of the 2018-2019 school year, please help us in encouraging your student to be here all day, every day at McKay High School. 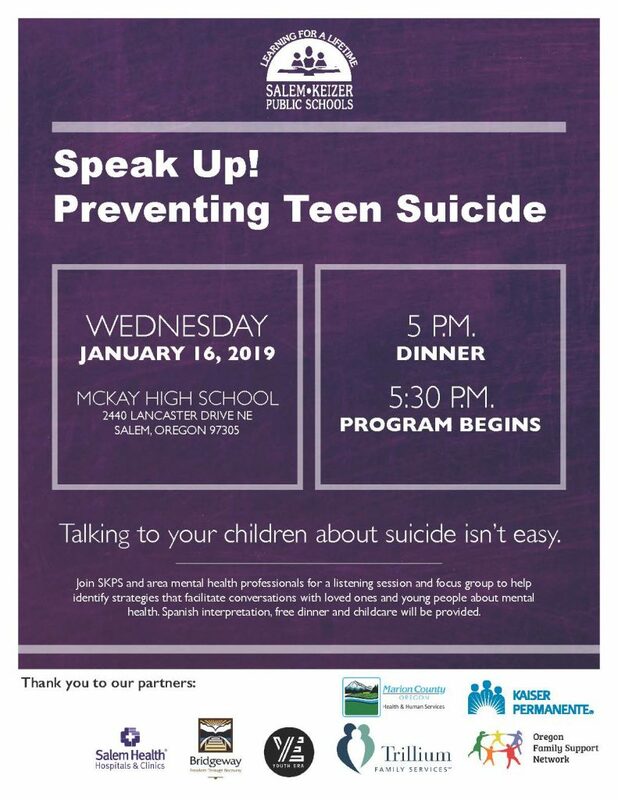 I want to invite our community to an upcoming event we are hosting here at McKay on January 16th, 2019. Talking to your children about suicide is not easy. Please join us and area mental health professionals in a listening session and focus group to help identify strategies that facilitate conversations with loved ones and young people about mental health. This is an important event for us as a school community. Please join us for dinner starting at 5:00 pm. Speak Up! Preventing Teen Suicide will run from 5:30 – 7:30 pm. We will also be providing child care for this event. I hope to see you there. A Boundary Task Force has been reviewing boundaries in all Salem-Keizer high school feeder systems. This group is working to balance enrollments across the district and to make sure we fully utilize the additional capacity built into the 2018 bond program. This group will be making boundary recommendations that will be presented at the December 11th, 2018 School Board meeting. McKay parent and community input is critical in this process so I am inviting you all to attend one of two Boundary Open House events with me at CTEC on Portland Road. Dates: Tuesday, October 30th and Tuesday, November 13th. Again, these are opportunities for input into this process. I look forward to seeing you there. Likewise, please mark your calendars for our Fall Student Led Conferences here at McKay. These are scheduled for the evening of Monday, November 19th and the afternoon and evening of Tuesday, November 20th. These are student-led and provide valuable insight in your student’s present level of performance, academic and extracurricular goals and opportunities to connect with teachers. These are also required for all students as part of CCR (College and Career Readiness) classes. We will be sending out a detailed schedule over the next week or so. Our vision is ‘All students will graduate college and career ready.’ We are so excited to be partnering with each of you in support of our students as we work to ensure our vision is realized for every student here at McKay. With it being the first week of school, our staff and students are working diligently in classes reviewing procedures and expectations, course requirements and, most importantly, allocating adequate time to develop relationships and a strong sense of community in every classroom. We believe this work is foundational to the start of the year. Developing a safe and welcoming environment is key to effective learning outcomes for all students. Another area that we believe is foundational to student success is the importance of regular attendance. We expect all students to attend 90% or more of their classes for the year. To put this in perspective, students must attend at minimum 9 out of every 10 school days. If students attend less than this 90% mark, it affects learning and creates gaps key information students must know in order to be successful in classes. Attendance matters and regular attendance will improve academic success. As we start the 2018-2019 school year, I ask that we as a community continue to support our students’ ability to attend regularly. We have numerous supports for our students and families in the area of regular attendance so please feel free to call our office at 503.399.3080 to get more information and resources on attendance. We appreciate the continued partnership and support to ensure all students graduate college and career ready here at McKay High School. The spring is an exciting time of the year as we celebrate our students’ accomplishments and begin planning for the coming year. For our seniors and their families, we are excited to be celebrating you all at graduation on Friday, June 8th at 8:00 pm at the Pavilion at the Oregon State Fairgrounds. Our team is working to finalize our planning around this event. There are some adjustments we are required to make this year. This is to meet both facility and safety guidelines for the Pavilion location. We are expecting a large graduating class here at McKay of over 500 students. The Pavilion has a maximum capacity that cannot exceed 5,000 people. The fact is we have outgrown what is currently the largest venue we can rent to hold our graduation ceremony. For the last two years, there have been security and safety concerns because of overcrowding in the seating areas. Each McKay HS graduate will receive 10 tickets for this event. Each graduate will be surveyed for the number of tickets they may need for graduation. We can guarantee 10 tickets per graduate to start and will consider requests for additional tickets if other graduates are not using all 10 of their allotted tickets. Tickets will be distributed to graduates on Tuesday, May 29 with their caps & gowns. Only guests with tickets will be allowed into the Pavilion. Children under age 5 who can sit on a parent/guardian’s lap will be allowed without a ticket. We recognize that changes in our processes can, at times, be difficult to navigate. We truly thank you for your patience and understanding with this new process and in helping us ensure that we can provide a memorable graduation for our seniors in a safe and secure environment. La primavera es una época emocionante del año en la que celebramos los logros de nuestros estudiantes y comenzamos a planificar para el próximo año. Para nuestros estudiantes del 12do grado y sus familias, estamos entusiasmados por celebrar su graduación el 8 de junio a las 8pm en el Pavilion del Oregon State Fairgrounds. Nuestro equipo de organización está trabajando para finalizar la planificación de este evento. Han surgido algunos ajustes que se nos ha requerido hacer este año. Esto es para cumplir los lineamientos de seguridad general y los establecidos por las instalaciones del Pavilion. Esperamos la asistencia de un gran número de graduandos en McKay de más de 500 estudiantes. El Pavilion tiene una capacidad máxima que no puede exceder de 5000 personas. En efecto, nosotros hemos sobrepasado la capacidad máxima de los lugares de mayor capacidad que podemos alquilar para llevar a cabo nuestra ceremonia de graduación. En los últimos dos años, hemos tenido preocupaciones de prevención y seguridad debido a la superpoblación en las áreas de los asientos. Cada graduando de la Escuela Preparatoria McKay recibirá 10 boletos de entrada para este evento. Cada graduando será encuestado acerca del número de boletos que ellos puedan necesitar para este evento. Garantizaremos 10 boletos por graduando para comenzar y consideraremos las solicitudes de boletos adicionales si otros graduandos no usarán todos sus 10 boletos asignados. Los boletos de entrada les serán entregados a los graduandos el martes 29 de mayo con sus togas y birretes. Solo los invitados con boleto les será permitida la entrada al Pavilion. Los niños menores de 5 años de edad que se puedan sentar en el regazo de sus padres serán permitidos sin boleto de entrada. Nosotros reconocemos que los cambios en los procesos, en algunas ocasiones, pueden ser difíciles de aceptar. Nosotros verdaderamente apreciamos su paciencia y comprensión en este nuevo proceso y su ayuda a asegurar que podamos proveer una graduación memorable para nuestros graduandos en un ambiente seguro y a salvo. As principal of McKay, I want to inform you about a possible student walkout that may occur on Friday, April 20. I hope that this communication allows you to better understand what may occur that day and to give you an opportunity to have discussions with your student about this event. First, any type of student led demonstration/walkout that occurs is not a McKay High School sanctioned or endorsed event. As always, our students are allowed to exercise their right to freedom of speech. Student and staff safety is always our top priority. We work with our partners at the Salem Police Department and with our own security team to ensure our students and staff are safe and that we can maintain a learning environment during any student led/demonstration or walkout. Back in March, some of our students participated in a national walkout that honored the 17 victims of the Parkland, Florida tragedy. That demonstration was peaceful, remained on campus and students returned to class after the 17-minute walkout. The reason I write to you today is that our students organizing this walkout have informed me that they will be leaving campus to join others at the Oregon State Capitol. I want to give you as much information as I have so you can be informed. • The walkout will begin at 10 a.m. on April 20 with students who choose to participate. • The demonstration is to call for Gun Policy Reform. • There are no plans to conduct the walkout on campus. Students have a planned route that they will walk to get to the Oregon State Capitol. • The McKay High School staff and security will work to ensure that our students are safe from the point of walkout to exiting campus. None of our McKay staff or security will supervise the demonstration at the Capitol. • When students leave campus for the demonstration, it will be an unexcused absence. • We encourage students to prearrange this unexcused absence so we can best account for all of our students that day. Here are some important things to know and talking points with your student if your student elects to participate in the April 20 walkout off campus. • As this walkout is not a McKay sponsored event, it is important to know that if students leave campus, they are choosing to enter an uncontrolled environment where there will not be supervision from staff at McKay High School or Salem-Keizer Public Schools. This is why we feel it is extremely important for students to stay on school grounds. • The District’s transportation policies and schedule will not be altered for this event. SKPS will not be liable for any incidents that may occur from non-approved forms of travel during this non-sponsored activity. • The District will work with local law enforcement to help keep students as safe as possible while off campus. It is important to understand that students leaving campus will no longer be the responsibility of Salem-Keizer Public Schools. Please call or email me if you have questions or want to discuss this in further detail at 503.399.3080. McKay High School has an exciting opportunity to teach computer science to our students starting in the 2018-2019 school year, see attached. I would like to update our community on the 2018 Proposed Bond on the May 15th Ballot. The proposed bond package totals $619.7 million and if passed by voters in May, is estimated to increase the current property tax levy rate by $1.24 per $1,000 of assessed value. Incrementar las medidas y los procedimientos de seguridad, con inclusión de instalaciones y alarmas antisísmicas en las escuelas. Agregar aulas nuevas o agrandar las existentes para aliviar el problema de la superpoblación estudiantil y prepararse para la matrícula futura, con inclusión de aulas de educación general y salones de música. Agregar aulas nuevas o agrandar las existentes para la docencia técnica-profesional (vocacional) en las seis escuelas preparatorias tradicionales y en la Escuela Preparatoria Roberts. Agregar laboratorios de ciencias nuevos o renovar los existentes en las escuelas intermedias y preparatorias. La propuesta de ley tiene un valor de $619.7 millones. En caso de que los votantes la aprobasen en mayo, se calcula que incrementaría el impuesto actual sobre bienes inmuebles en $1.24 por cada $1,000 del valor de tasación. El plazo para inscribirse vence el 24 de abril. El 25 de abril se enviarán por correo las boletas electorales. Para informarse a fondo sobre este asunto, por favor, acceda a la página web siguiente: www.bondinfo.salemkeizer.org. I want you to know that starting this spring McKay High School, North Salem High School and Salem-Keizer Public Schools will be partnering with Dr. Salam Noor and Mountain West Investments with a clear goal on improving student success through educational innovation opportunities. This is a four year partnership with a goal to improve the graduation rate at both McKay and North by at least 10% during that time. On behalf of the McKay, we are grateful for this opportunity and partnership. We are excited for the collaboration and support as we move our community closer to our vision of ‘Every McKay student graduating college and career ready.’ I will continue to update our community as we launch and begin this work. This is the statement by Principal Schoepper that staff shared with students today regarding this loss of one of our students. Today we learned of a devastating loss to the Royal Scot family. Last night, Alfredo Hernandez, a junior here, lost his life in a shooting off campus. We are all deeply saddened by this loss. Alfredo will forever be part of our school, our community and our McKay family. When events such as this occur, it is not unusual for us to react with shock, sadness, fear, anger and other feelings. Those reactions may rise and fall throughout the remainder of the day, and even for days to come. Some of us will want to have quiet time alone, and others may want time to talk with peers or adults. Some of you who didn’t know Alfredo may be ready for teachers to return to academics sooner than others. We all need to practice patience and respect for each other. We encourage you to talk about Alfredo and remember him. If you need additional help or time to talk about your feelings, you may go to the Safe Room, which is located in our McKay library. Counselors will be available all day and as long as you need them. You will be expected to sign out of your class and into the Safe Room. It is important that you be in a setting with an adult present. For your wellbeing, tight accountability of attendance is critical during time of trauma and loss. As I’m sure you’ve noticed, we have additional law enforcement on campus today. Please feel free to talk to them about any safety concerns you may have. Your safety and your wellbeing, both physically and emotionally, are our greatest priorities. We are here for you. We will give you the space you need to grieve. It was nice welcoming our community back from the long winter break last week. We have successfully transitioned back into learning here at McKay High School. As I have visited classrooms and have conferenced with both students and staff, our community is working hard to prepare for semester one finals here at the end of the month. We ask that you continue to conference with your student regarding assignments and activities. Likewise, please remember that if students need additional support, we provide after-school tutoring in our library every day until 5:00 pm. Teachers are also available to meet directly with both students and families. Before the winter break, we hosted a McKay-area community meeting to review facility needs as well as projected enrollment numbers. We also reviewed the initial conceptual design for McKay High School, which will address these needs. I appreciated all the McKay community who came to our meeting to hear about this and to provide input into the process. For those of you who could not make it, I am attaching this information to review. Please know that I am happy to discuss this information with you at any time. Please call the office directly at 503.399.3080. Nos dio mucho placer darle la bienvenida a nuestra comunidad luego de las largas vacaciones invernales. La transición a las clases diarias ha sido exitosa en la Escuela Preparatoria McKay. En mis visitas a las aulas y en las conversaciones con el personal y con los alumnos, me he dado cuenta de que la comunidad se esfuerza al máximo por prepararse para los exámenes finales del semestre, los cuales se harán a fines del presente mes. Les pedimos que sigan al tanto de las tareas de clase y de las actividades estudiantiles. Asimismo, por favor, recuerden que, si el alumno necesita apoyo complementario, en la escuela damos tutoría diaria en la biblioteca después de clase hasta las 5 de la tarde. Los maestros también están en la mejor disposición de reunirse con los alumnos y las familias cuando sea necesario. Antes de las vacaciones invernales, celebramos una reunión con la comunidad que vive en la zona de asistencia de McKay para conversar sobre las necesidades de la escuela, la proyección de la matrícula y el diseño conceptual de la Escuela Preparatoria McKay. Les damos las gracias a los miembros de la comunidad que acudieron a la reunión para expresar sus opiniones sobre estos asuntos. En beneficio de los que no asistieron a la reunión, adjunto dicha información a la presente carta. Por favor, tengan la certeza de que estoy a la disposición de ustedes para conversar en cualquier momento sobre los temas que tratamos en la reunión. Por favor, llamen a la oficina al teléfono 503.399.3080. Agradecemos la colaboración y el apoyo de todos en la Preparatoria McKay mientras continuamos trabajando a fin de hacer realidad nuestra divisa: “Todos los alumnos se graduarán listos para la Universidad y para la vida profesional”. I wanted to be sure to follow up regarding the incident this morning whereby McKay High School was identified in a graffiti threat up in Keizer. Student and staff safety is always our top priority and, as a result, we err on the side of safety if there is any possibility of a dangerous situation. We have worked closely with both the Salem and Keizer Police and our Security Department to ensure all students and staff were safe during this time. Thankfully, we have never had a serious incident. While today has not been a typical day at our school, I want to commend our community for how we came together during this situation. We do not take threats lightly. I appreciate everyone involved who took steps to keep our students, staff and community safe. Again, school safety is a team effort and we appreciated the cooperation of students, staff, parents and police. The Keizer Police are still investigating the graffiti, and if anyone has any tips, please call 503-390-3713 or email Tips@keizer.org. Individuals can remain anonymous. Reference Keizer Police Department Incident #17-4776. Quiero asegurarme de mantener un seguimiento respecto al incidente de esta mañana en donde la Escuela Preparatoria McKay fue identificada en una amenaza hecha en un grafiti en el área de Keizer. Nuestra mayor prioridad es la seguridad de los estudiantes y del personal docente, y como resultado, preferimos ser precavidos en caso de que exista la posibilidad de una situación peligrosa. Hemos trabajado tanto con la policía de Salem como con la de Keizer, y con nuestro propio departamento de seguridad, para garantizar que todos los estudiantes y el personal docente estén a salvo. Afortunadamente, nunca hemos tenido un incidente serio. A pesar de que hoy no ha sido un día típico en nuestra escuela, quiero elogiar a nuestra comunidad por la forma en la que nos unimos durante esta situación. No tomamos las amenazas a la ligera. Me siento muy agradecido por todos los participantes quienes tomaron la iniciativa para mantener a los estudiantes, personal y a la comunidad a salvo. Nuevamente, la seguridad de la escuela es un trabajo en equipo y agradecemos la cooperación de los estudiantes, personal, padres y de la policía. La policía de Keizer aún está investigando el grafiti y si alguien tiene alguna información al respecto, por favor, llame al 503-390-3713 o escriba a Tips@keizer.org. La identidad de los informantes permanecerá anónima. Llame al Departamento de Policía de Keizer y utilice el número de incidente 17-4776. It is hard to believe we are into November. It feels like yesterday when we met with our incoming freshman on the first day of school. These students are now almost a third of the way into their first year here at McKay. I have been impressed with our student body. They are showing up to school, working hard both academically and in extracurricular activities. Likewise, our staff is continuing to work collaboratively on implementing instructional strategies we identify as WICOR (Writing, Inquiry, Collaboration, Organization and Reading). By providing our students access to these college and career readiness strategies our students are developing skills to be critical thinkers, problem solvers, along with the ability to collaborate as part of a team. We know these skills are essential to their success in college or careers. Please remember that we are hosting the ‘McKay Area Bond Listening and Learning Forum’ on Thursday, November 16th at 6:00 pm. Parents and student in our McKay High School Feeder and any interested staff and community members are invited to attend this event. This is an opportunity for our community to learn and share about needs of our schools along with how the proposed bond measure would address these needs. Please call me directly here at McKay if you have questions at 503.399.3080. On Monday, November 20th in the evening and all day Tuesday, November 21st will be having our fall Student Led Conferences. These are opportunities for our students to share their course progress and goals, discussing overall strengths and weaknesses and answering questions posed by parents or guardians. Please note that these Student Led Conferences are a requirement to receive credit in CCR class (College and Career Readiness Advisory Classes). Both our students and staff have been working hard in preparation for these conferences. We hope to see you there. All of us here at McKay are excited about the new school year. It is hard to believe that we are approaching the first grading period. We have had a successful start to the year. Because you all are a key part of how we support the success of our students, I want to keep you up-to-date on topics that are important to our community. One of these topics is the improvements that schools in our district need. Over the last two years, the school district’s Facilities & Planning Department staff and a contracted architectural firm created a plan that identifies and addresses the physical needs of school and support department buildings. Along with school principals and select school staff, the planning team assessed all buildings in the school district, examined population projections, and the space needs of our programs. Their work fulfilled a state requirement to create a Long Range Facilities Plan that lists the improvements each school and support department needs in order to meet enrollment projections, and to provide the kinds of spaces that will support our educational programs for the next several years. Our schools need additional space to support current enrollment and projected enrollment. Enrollment in our district has grown steadily over the years, and is expected to continue. Enrollment projections predict almost 1,000 new students in Salem-Keizer in only five years. That’s about the equivalent enrollment of two elementary schools or one middle school. Five of our six traditional high schools are already at or over capacity. More than half of our 42 elementary schools and 10 of our middle schools need some kind of additional or expanded space, ranging from classrooms to gyms to cafeteria expansions and more. CTE programs, formerly called vocational programs, have a powerful effect on students. In our district, students who concentrate on a CTE program have a graduation rate of about 87 percent. The state average graduation rate for all students is about 75 percent. It’s easy to understand why CTE is important and we need to continue to support our students’ ability to access this program. Some spaces used in our schools for science education are simply a classroom with a sink. This limits our educators’ ability to offer the kind of science education the 21stcentury demands. Additionally, our middle schools don’t have enough science education spaces to support a full year of science classes. Middle school students in our district are currently offered one half-year of science education. Ten of our middle schools and all of our comprehensive high schools need new or renovated science classrooms. Our high schools also need fully equipped chemistry labs. Our district has made good progress in the past in retrofitting buildings for seismic safety, but there’s still more work to do. Our engineers have performed initial screenings to identify areas in schools that need strengthening that would allow students and staff to safely exit buildings if a major earthquake were to occur. The areas that need strengthening are categorized from low to very high risk. Addressing the highest risk areas first is one of our goals in making seismic improvements. Another goal is to upgrade the design standard of additions to allow them to be re-occupied immediately following a major earthquake, not just allow safe exit from the building. A citizen’s task force reviewed the list of facility needs, and felt the work was necessary. However, the cost to complete the work is estimated to total around $620 million. This is far beyond what the district can afford to pay from the operating budget. The citizen’s task force recognized this, and recommended that the School Board pursue a general obligation bond to fund the construction work. The School Board accepted the recommendation, and voted to place a bond measure on the ballot in May of 2018 for the community to consider. It’s important to remember, however, that the bond package is not yet final. The School Board will continue to discuss the bond in upcoming meetings. Future news about the bond package will be posted on the district’s website and in our school newsletter. To read more about the district’s facility needs and the history of the bond package please visit www.salemkeizer.org/category/sitewide/school-board. Thank you for all your continued support of our students and staff here at McKay High School. Todos nosotros en la Escuela McKay sentimos gran emoción por el inicio del año lectivo. El año ha empezado bien, y nos causa gran gozo regresar y hacer algo que disfrutamos bastante: preparar a los estudiantes para la graduación y una vida llena de éxitos. Usted es un factor importante para nuestro éxito y deseamos mantenerle informado sobre los temas de importancia en la escuela. Uno de estos temas tiene que ver con los mejoramientos que necesitamos en las escuelas de nuestro distrito. Durante el trascurso de los últimos dos años, el personal del Departamento de Instalaciones y Planificaciones del Distrito y un bufete de arquitectos crearon un plan para identificar y planear cómo satisfacer las necesidades existentes en los planteles escolares e instalaciones del distrito. En conjunto con algunos directores de las escuelas, un grupo selecto de personal escolar y el equipo de planeación evaluó todos los planteles e instalaciones del distrito escolar, analizó las cantidades de matrícula proyectada y la necesidad de espacio para la función de nuestros programas. El trabajo que el equipo realizó cumple el requisito estatal de crear un plan a largo plazo de las instalaciones del distrito que dicte los mejoramientos que cada escuela y departamento necesita para la matrícula proyectada y para poder proveer el espacio necesario y apoyar el funcionamiento de nuestros programas educativos durante los próximos años. • Necesitamos más espacio en nuestras escuelas para la matricula proyectada. La matrícula en nuestro distrito ha aumentado ininterrumpidamente durante los años y se espera que continúe aumentando. La matrícula proyectada indica que tendremos un aumento de casi 1,000 nuevos estudiantes en Salem-Keizer en solo cinco años. La matrícula es equivalente a la de dos escuelas primarias y una escuela intermedia. Cinco de las seis escuelas preparatorias tradicionales ya casi están al máximo de capacidad o ya están sobrepobladas. Más de la mitad de las 42 escuelas primarias y 10 de las escuelas intermedias necesitan algún tipo de expansión o espacio adicional para salones de clases, expansiones en los gimnasios o la cafetería y más. Los programas de CTE, anteriormente conocidos como programas vocacionales, tienen un efecto profundo en los estudiantes. En nuestro distrito, los estudiantes que se enfocan en un programa de CTE tienen un índice de graduación de aproximadamente un 87 por ciento. El índice promedio de graduación para el estado de todos los estudiantes es aproximadamente un 75 por ciento. Es fácil comprender la importancia de los programas de CTE. Algunos de los espacios utilizados en nuestras escuelas para ciencias son sencillamente un salón de clases regular con un lavabo. Esto pone límites a las habilidades de nuestros maestros para ofrecer la educación de ciencias requerida en el siglo 21. Adicionalmente, nuestras escuelas intermedias no tienen suficiente espacio designado para que los estudiantes tomen ciencias durante todo un año lectivo. Actualmente, a los estudiantes de escuela intermedia se les ofrece medio año de ciencias. Diez de nuestras escuelas intermedias y todas nuestras escuelas preparatorias necesitan un laboratorio de ciencias nuevo o renovaciones en los salones de clase de ciencias existentes. Nuestras escuelas preparatorias también necesitan laboratorios de química completamente equipados. En el pasado, nuestro distrito ha logrado hacer un buen progreso en reforzar las escuelas para la seguridad antisísmica, pero aún queda más trabajo por terminar. Nuestros ingenieros han realizado las evaluaciones iniciales para identificar las áreas en las escuelas que necesitan reforzamiento, lo cual permitiría a los estudiantes y al personal salir seguramente de los edificios en caso de que ocurriera un gran terremoto. Se designan por categoría las áreas que requieren reforzamiento desde bajo riesgo hasta alto riesgo. Una de nuestras metas es primero dirigir nuestra atención a las áreas de alto riesgo para mejoramientos de reforzamiento antisísmico. Otra meta es actualizar las instalaciones de acuerdo al estándar de diseño para los mejoramientos antisísmicos que permiten la entrada a las instalaciones inmediatamente después de un gran sisme además de la salida segura en caso de una emergencia. Un grupo de voluntarios para la planificación de las instalaciones revisó la lista de las necesidades en las instalaciones y determino que tal trabajo era necesario. Sin embargo, el costo estimado para completar el trabajo es aproximadamente un total de $620 millones. Esto sobrepasa la posibilidad del distrito para sufragar los gastos con los fondos del presupuesto operativo del distrito. El grupo de voluntarios para la planificación de las instalaciones reconoció este hecho y recomendó que la junta directiva escolar del distrito persiguiera una iniciativa para un bono de obligación general para sufragar el trabajo de construcción. La junta directiva escolar aprobó la recomendación y voto para colocar la iniciativa del bono de obligación general en la boleta electoral de mayo de 2018 para la consideración de la comunidad. Sin embargo, es importante recordar que los planes de la iniciativa para un bono de obligación general son solamente preliminares. La junta directiva del distrito escolar continuará dialogando sobre el bono de obligación general en sus reuniones próximas. Las noticias acerca del bono se publicarán en la página web del distrito escolar y en nuestro boletín escolar. Para leer más información sobre las necesidades en las instalaciones del distrito y la historia completa de la iniciativa para un bono de obligación general, por favor, consulten el siguiente sitio de internet: www.salemkeizer.org/category/sitewide/school-board. Muchas gracias por todo su apoyo para los estudiantes de nuestra escuela y de todo Salem y Keizer. Anticipo otro excelente año colaborando con ustedes para el beneficio de nuestros estudiantes. A continued part of our work this year in making this a reality is through our CCR (College and Career Readiness) classes. We believe that CCR not only support students’ ability to create positive relationships with peers and staff, but also supports their development with essential skills like critical thinking, oral academic language development, organization/time management, goal setting and planning for post-graduation success. We know these skills are essential to both their academic and ultimately career success. CCR will take place twice each week on Thursdays and Fridays. It is scheduled after 1st and 5th periods each day and runs around 30 minutes. CCR is a pass/no pass class and will count for .25 credits each year. Students spend time in CCR preparing for Student-Led Conferences scheduled for November and March. These nights are focused on career and college readiness—how to prepare for, get into, and succeed in post-secondary education (Career Tech, Two and Four year degrees). Please check our website for updates and specifics as these events approach. We look forward to your participation. Scots Scholars is for all McKay students. During Scots Scholars, students are able to access the computers, as well as work with teachers on class assignments. The hours for Scots Scholars are 9 a.m. to 12 p.m. with free breakfast served at 8:30 a.m. and free lunch served at 12:00 p.m. Ensuring that your student is completing his/her assignments and learning the appropriate skills and content for each class, will help guide him/her to success at McKay and beyond.